My launcher is T-UI. A CLI based launcher with some cool built in commands. The colours and some other settings are customisable, and there is an alias file. (17-03-2017, 07:10 AM)pyratebeard Wrote: My launcher is T-UI. A CLI based launcher with some cool built in commands. Why do you think a CLI is the best UI for a phone? (17-03-2017, 07:15 AM)venam Wrote: Why do you think a CLI is the best UI for a phone? I don't necessarily. I thought I'd give it a shot and ended up liking it. I enjoy the lack of icons, and the general geekiness of it. It's Nova, with an icon theme (Whicons at the time of that screenshot, I think). The whole "terminal window" background behind the icons, along with the prompt text, was edited onto the wallpaper using GIMP. 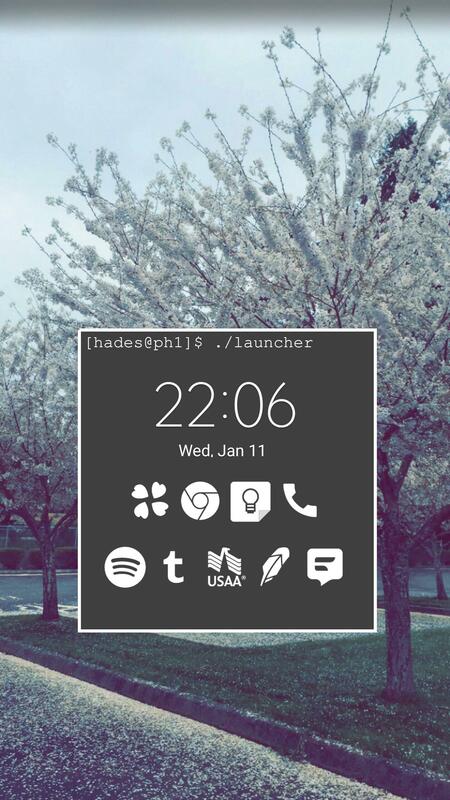 The clock is a standard clock widget.